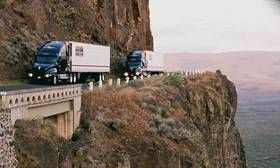 As you probably realize there are tens or even hundreds of thousands of trucking companies nationwide. There are some as small as one truck and some as large as tens of thousands of trucks. There are local, regional, and over the road companies and some that are a combination of two or even all three. There are tanker, flat bed, reefer, dry van, dump, and a multitude of other types of trucks you can drive. There are companies that specialize in one type and companies that have a combination of several different types. So with all of these choices presented to you how do you know where to start your career? To tell you the truth it's not that hard. Let's cover some of the key points you should focus on. First let's start with your lifestyle. Are you married? Divorced? Do you have children? Do you love adventure? Would you like to travel extensively and see the country or have you already had that chance and want to stay near home? So with all of these choices presented to you how do you know where to start your career? To tell you the truth it's not that hard. Home time is one of the most important considerations you should make. There is one point I can not stress enough – if you have a family of your own, please, please, please don't take an over the road job where you are gone for weeks at a time. It's been done by thousands of drivers over the years and is being done by thousands today, but the stress it puts on every member of the family is enormous and is simply not necessary. There are tons of opportunities in the industry to make good money and be home at least every weekend, often times every night. Countless numbers of families have split up because of the time apart. I certainly don't want to see that number grow. Even regional jobs can be very stressful, but I think it can be done. It will definitely test your relationship both as a couple and with your children though. Ideally you would like to be home with your family everyday but often times your financial situation dictates that you get a really good paying job which you may not be able to find in a local company. Be forewarned, even a regional job will be a HUGE test of your family's strength, not to mention you will miss so much of your family's lives. There is one point I can not stress enough – if you have a family of your own, please, please, please don't take an over the road job where you are gone for weeks at a time. You may be married, or in a serious relationship, but you don't have any children. There are a lot of couples that travel together. In some cases both are drivers and share the driving duties. In other cases only one drives and the other helps in varying degrees with navigation, phone calls, paperwork, and in a variety of other duties. But again be forewarned... the inside of your truck is the size of a walk-in closet and you two will be together nearly non-stop 24 hours a day, seven days a week. I don't know if you've ever tried to share a tiny space with another person practically ever minute of every day but it is very difficult. At best it will take a lot of getting used to and at worst you will be at each other's throats after a while. Some couples can handle it, many can't.